A federal judge has issued a partial stay on Thursday night with regard to his ruling that California's ammunition magazine ban and confiscation law is unconstitutional. Judge Roger T. Benitez of the District Court for the Southern District of California granted part of California attorney general Xavier Becerra's (D.) request to put a hold on the ruling while the state pursues an appeal. The stay issued by Benitez will continue to block the portion of the law prohibiting possession of magazines capable of holding more than 10 rounds of ammunition but will allow the state to begin enforcing provisions against the sale of such magazines again. It includes, however, a provision protecting those who sold or bought the affected magazines within the period of time between the initial ruling and 5 p.m. PST on Friday. Benitez had ruled last Friday that California's law violated the Second Amendment and must be completely thrown out. In the wake of that ruling, all ammunition magazines became legal to sell, buy, and own within the state, prompting companies like Magpul Industries to begin selling their previously banned products to Californians. It also prompted Becerra to request a stay on the ruling and announce an appeal to the Ninth Circuit. "California leads the nation when it comes to gun safety," he told the Washington Free Beacon earlier this week. 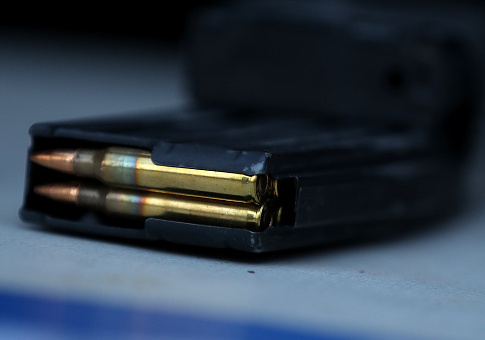 "Yesterday, we sought a stay of a court ruling that jeopardizes our state's firearm law prohibiting individuals from acquiring new large-capacity magazines. We intend to protect our people and our gun safety laws from senseless attacks. We refuse to go backwards." Benitez wrote in his new order that he does not believe California has a good case but realizes other judges may disagree with him. "The Attorney General has not made a strong showing, to this Court, that he is likely to succeed on the merits," he said. "Nevertheless, both sides are aware that other courts have come to contrasting conclusions on similar issues. Of course, facts matter and the facts are different. Strong and thoughtful views may be found on both sides of the important legal questions presented by this case. This Court's decision cuts a less-traveled path and the outcome is very important to all citizens." He also noted a stay would cause harm to those seeking to own the specified magazines. "Without question, entering a stay pending appeal will harm the Plaintiffs, and all others like the Plaintiffs (who are many), who would choose to acquire and possess a firearm magazine holding more than 10 rounds for self-defense," he wrote. "It is well established that the deprivation of constitutional rights ‘unquestionably constitutes irreparable injury.'" Ultimately, Benitez decided the partial stay was the best path forward as the case continues to make its way through the courts. "There is an immeasurable societal benefit of maintaining the immediate status quo while the process of judicial review takes place," he wrote. This entry was posted in Issues and tagged California, Gun Control. Bookmark the permalink.